23/10/2013 - Sound macroeconomic policies and the commodity boom have helped Chile record an enviable period of economic growth and job creation. Further reforms are needed to make the labour market more inclusive and growth greener, while more could be done to support innovation and entrepreneurship, according to the latest OECD Economic Survey of Chile. The new Survey, presented in Santiago by OECD Secretary-General Angel Gurría and Chile’s Finance Minister Felipe Larraín, forecasts that the Chilean economy will grow by 4.2% in 2013 and 4.5% in 2014. The OECD remains optimistic on public finances, the banking system, external transactions and inflation remaining in check. Per capita income has crossed the threshold of $20,000, which is the highest in Latin America. 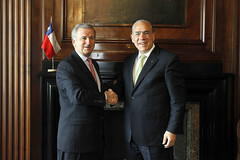 “Chile has made terrific gains since it joined the OECD,” Mr Gurría said. “Its commitment to open trade and investment regimes, bringing it together with other major economies in the region via the ‘Pacific Alliance,’ is welcome. This commitment, along with sound public policies, will continue to support Chile’s economic convergence with the OECD average GDP,” Mr Gurría said. “The challenge going forward is to ensure that the tremendous economic performance is shared among all Chileans. (Read the full speech)"
The Survey says that making labour markets more inclusive would be a key step. While recent reforms and strong growth have helped more women and young people enter the labour force, their participation rates remain low when compared to most OECD and Latin American countries. Changing attitudes toward women’s work and parenting roles, as well as greater provision of childcare, could reduce barriers to female employment, for the benefit of the economy as a whole. Better public employment services and training systems would help young people and low-skilled workers find jobs. Extending a reduced minimum wage for youth to cover young people under 25 years of age, rather than just those under 18, would also help them get their first footholds in the workplace. Better overall education, particularly in the early stages of compulsory schooling, should remain a priority. Chile can create jobs and foster growth by further boosting entrepreneurship and innovation, the Survey says. Increasing R&D investment would require higher numbers of science and technology graduates, as would improvements to government innovation programmes. Chilean policies to promote business angel investment and venture capital are seen as the best in Latin America, and offer a clear indicator that the country is open to foreign entrepreneurs. The OECD Survey points to Chile’s large environmental footprint, with particular concerns regarding air quality and water availability. Outside hydropower, the use of renewable energy sources is limited, and energy needs are largely met by imported fossil fuels. Chile’s green growth strategy should continue to reduce the cost to society of pollution and excessive resource use, notably with environmental taxes and other pricing mechanisms. This will abate emissions, as will the promotion of green innovation and new clean technologies. There is scope for the mining sector to continue reducing its large amounts of local emissions and soil contamination. Read the report, OECD Economic Survey of Chile, online, share, link or embed on your website. Media requests should be directed to the OECD’s Media Division (tel. +33 1 4524 9700).